I've always been fascinated by low-key photography because of how dramatic the high contrast between light and dark are. I've wanted to try it out myself, but I thought they were too complicated and I probably didn't have the right equipment to attempt it. After a seriously failed attempt at taking a few low-key portraits of myself, I gave up for a month. Yesterday, I decided to try it out again with a different setup and SUCCESS! I'll give an overview of the equipment I used, the "studio" setup and camera settings. 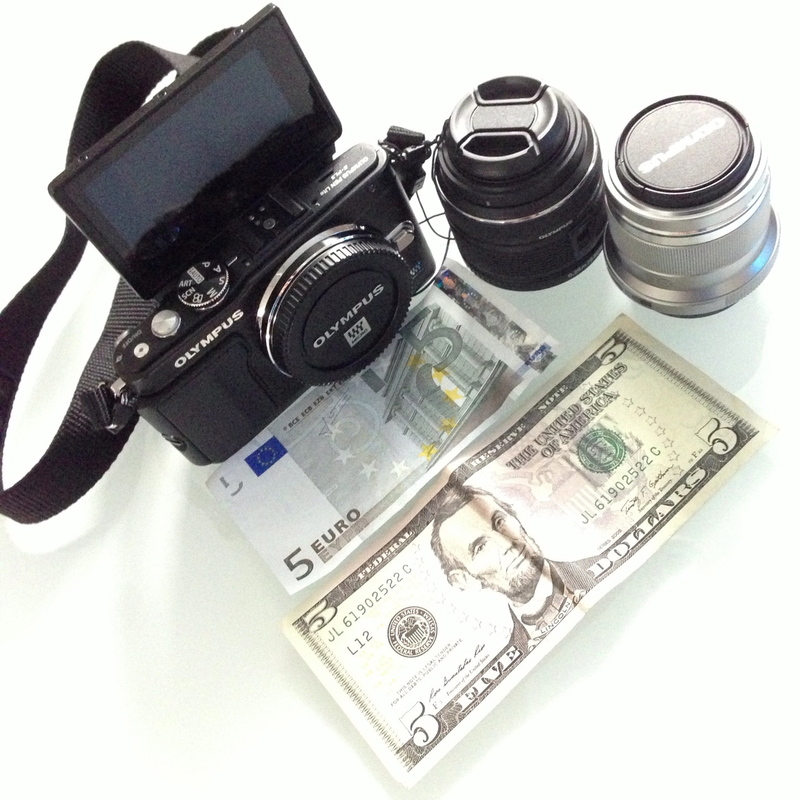 The camera I use for my portraits is the Olympus PEN E-PL5. It's a fantastic little mirrorless DSLR with an articulating viewfinder, which is great for taking self-portraits! As I mentioned in my post on How I Take Self-Portraits, I use my M. Zuiko Digital ED 45mm f1.8 prime lens (prime means that it doesn't zoom). The lens gives a lovely bokeh (where anything in that's not in the focus area is nicely blurred). I also used a wired or wireless remote control (depending on if my wireless remote's battery is dead. LOL!) and a tripod. 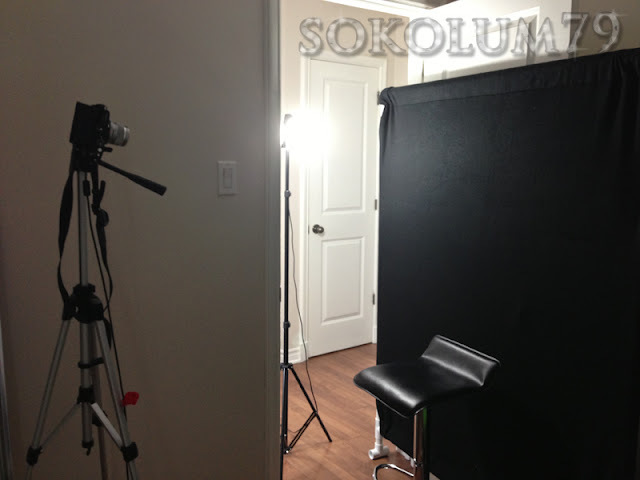 I have a black backdrop that I made from PVC pipe and black polar fleece. If you don't have fancy little backdrop you can always buy the fleece from a fabric store and drape it over a door. I used the black backdrop because it creates a higher contrast to the light hitting the face if there's a dark background rather than a light background. The last piece of equipment was a light source. Lighting is the "key" in low-key photography. Light from one direction is what gives the high contrast. I used one of my umbrella studio lights with the umbrella removed so it gave a harsh light. A tall lamp or one on a stool would also be a good source. The studio lamp is handy because you can adjust the height to give you the light direction that you prefer. My "studio" was set in between two rooms, one where I pulled my blackout blinds down, and one lighter room. I placed my camera in the dark room away from the light, the studio light in the light room facing the dark room and my backdrop and the stool (optional) in the doorway between the two rooms. I set my camera to M (manual) mode and set the ISO to 200 (the minimum setting, 100 would be best for the sharpest photos), my f-stop to 1.8 and my shutter speed to 50. You can experiment with your f-stop and shutter speed if you have those settings. DO NOT use your flash, unless you have a wireless flash that can also be used as your light source. I am almost never a fan of non-professional flash setups. You can also select black and white on your camera if you like, or adjust it in photoshop later. I took black and white and colour photos to test out how it would look. The portrait above was taken in colour, and changed to black and white in Photoshop, so either way works. I talk about the edits in Photohop in my Self-Portrait post, which is still the same. You can also increase the contrast if you want more drama in the photos. Another Vulcan Look... I Mean Vampire!